I have woven a yard or so of my huck lace, so I took a few pictures. According to what I have read, it will look quite different once it is off the loom and washed. I like how it looks at this stage and am looking forward to seeing how it turns out. Next I will do a section with a blue weft to match the warp. I’m not sure how the texture will show up in photographs. I work with a feline assistant. She mainly helps me keep to a schedule. 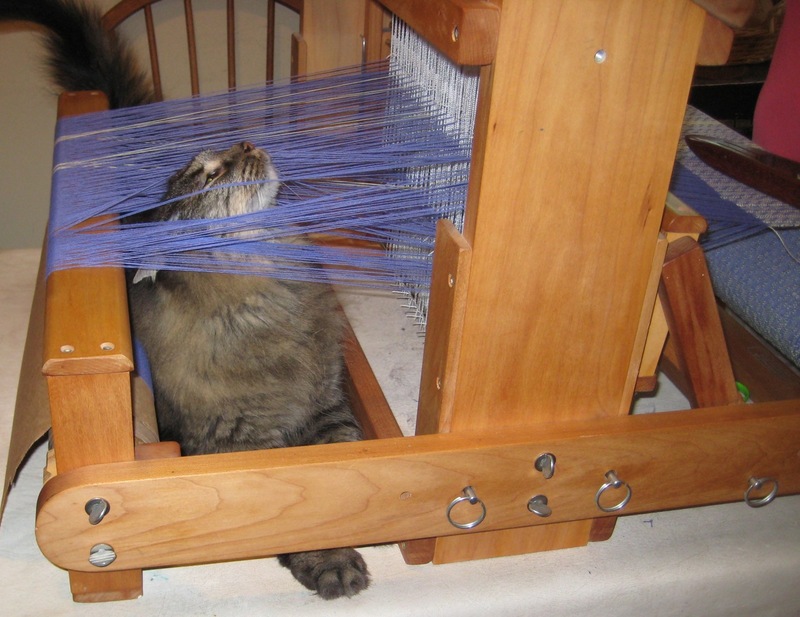 She reminds me to take walks and let her nap in peace and makes sure that once I have a warp on the loom I keep weaving until it is done, before she turns the warp into a cat’s cradle. I just finished my first huck lace project, four napkins. I used 10/2 mercerized cotton. I noticed several things with this weave: first, an even beat is very important. I have sections where my beat was either too loose or too heavy. This weave structure is unforgiving when it comes to the beat. Second, my selvages are not straight. 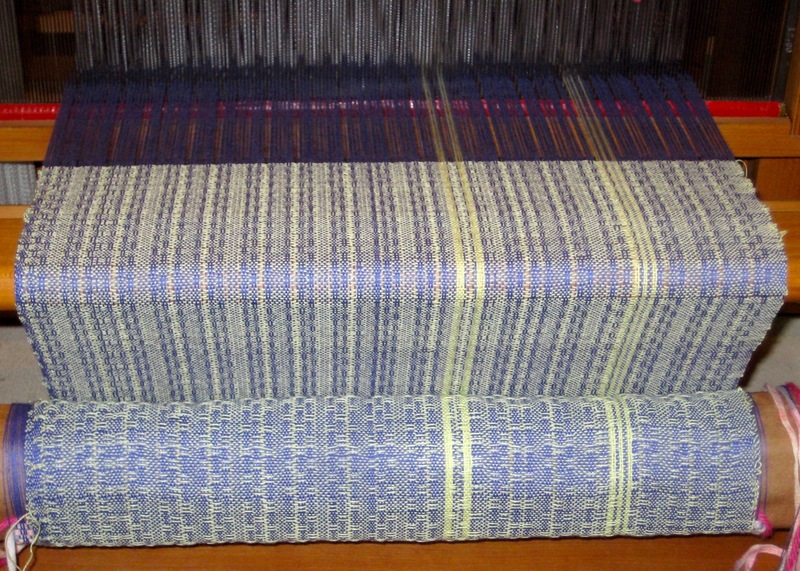 I did use a temple but I still see some areas where the selvage could be straighter. 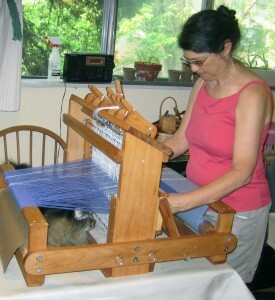 Third, my colors were an yellow warp and a pick weft, result were orange napkins. It is a pretty orange at least but not what I expected. I handwashed the napkins and saw no bleeding from the fabric. I guess it was the way the colors wove together to produce this effect. Interesting weave structure. It’s always fun to see how colors in the warp and weft interact. I think the amount of optical blending you get when using different colors depends on how fine the yarn is. With fine yarns or viewed from a distance, the colors blend as in a pointillist painting. I didn’t find the structure especially unforgiving or have more trouble with edges than usual. Maybe the unmercerized cotton I’m using is easier to work with than mercerized.